In your free time, take a Taipei green tour. Early in the morning, head to Fuyang Eco Park (富陽自然生態公園) and breathe in the fresh air. In the afternoon, enjoy a leisurely YouBike ride or stroll along Qingtian Street (青田街), admiring the old homes down the shaded side lanes and alleys. 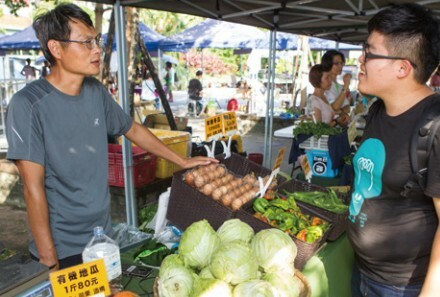 Then, visit the Water Garden Organic Farmers' Market (水花園有機農夫市集) at Taipei Water Park (自來水園區), and purchase a week's worth of groceries directly from small farm owners. At night, head to Treasure Hill Artist Village (寶藏巖國際藝術村) and get away from the daytime heat. Treasure hunting under the moonlight is a different way to have fun. A visit to Fuyang Eco Park is sure to be filled with pleasant surprises. Just a few minutes' walk takes you from an active area next to an MRT station to dense forest. This park, which occupies an area of 3.8 hectares, was originally the site of a military ammunition depot. Due to long-term restricted access to the area its ecology has remained intact, preserving a rare low-elevation forested area within a city and providing a convenient retreat. There are more than 300 species of plant within this park. Among them, at least a dozen are protected. According to the Society of Wilderness (荒野保護協會), plant hoppers lay their eggs in Chinese tallow trees in warm weather, and this is the best time to observe them. As these insects are a main food source for the Swinhoe's tree lizard, this is also when it is relatively easy to spot these reptiles. When they lie prostrate and their body becomes rigid, this is a warning not to encroach on their territory. 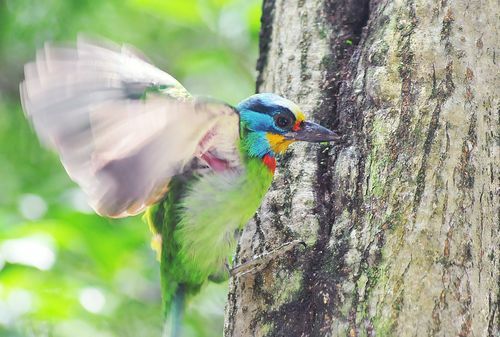 The so-called "Three Musketeers of Fuyang" (富陽三劍客) are the Muller's barbet, Japanese white-eye, and black bulbul. It is possible to spot these three bird species in the treetops. If you would like a deeper look into this green treasure-house, free guided tours are offered in the morning on the second Sunday of each month, with advance registration online required. Fuyang Eco Park: From Exit 1 of MRT Linguang Station on the Brown Line, walk approximately 5 minutes. Riding a bicycle or walking are the best methods for taking in the sights along Qingtian Street. 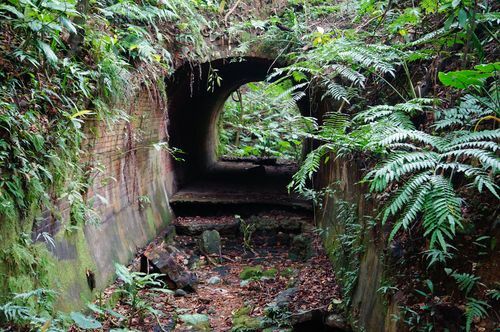 This was once an area of faculty housing for Taihoku Imperial University (today's National Taiwan University; 國立台灣大學). The scholars that lived here planted many types of tree, including sweetgum, bodhi, Magnolia kachirachirai, breadfruit, Taiwan incense cedar, and royal palm. Together, they form a continuous green canopy that is eco-rich, as they attract birds to nest. There are bird songs and calls year round. People, old homes, and old trees coexist harmoniously along Qingtian Street, creating a unique tranquility. 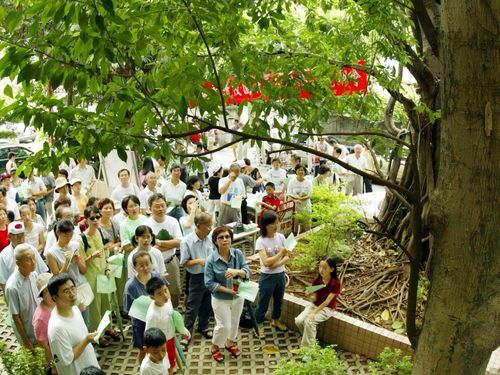 Community residents work in unity to protect these old trees, which connect to nearby Daan Park (大安森林公園) in a long green sprawl. Hong Qiujia (洪秋甲), chief of Lon-gan Borough (龍安里), says that, "The Malayan night heron, which prefers to stay hidden, has been seen flying from Daan Park to Qingtian Street to forage for food." 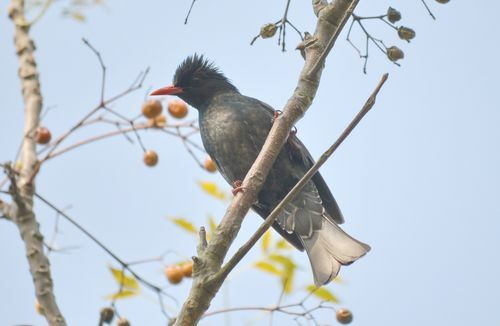 Other bird species can also be seen here, including Muller's barbets and ring-necked doves. 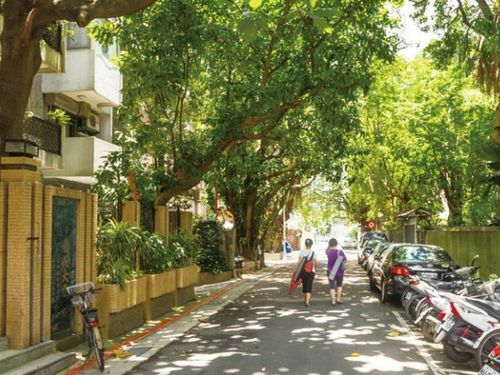 Visit Qingtian Street, enjoying the tranquil atmosphere under a flame tree, with its brilliantly colored blossoms, and observe how local residents are putting green living into practice by planting starfruit trees and dragon fruit. Water Garden Organic Farmers' Market - Fresh Produce to Take Home In Taipei Water Park, located in Gongguan (公館), you'll see a group of happy organic farmers manning stalls in the Water Garden from 10 a.m. to 5 p.m. every Saturday. View fresh fruits and vegetables of every imaginable color, and feel your mood brighten. A farmer from Zaoqiao Township (造橋鄉) in Miaoli County (苗栗縣) displays fresh cucumbers, okra, and long beans. From time to time, he can be heard sharing his farming experiences with passersby. From these conversations, it is easy to get a sense of his enthusiasm for organic farming. Another farmer, from faraway Pingtung County (屏東縣), runs a fruit orchard in the north of Gaoshu Township (高樹鄉). This producer has brought pineapples, dragon fruit, and papayas, as well as delicious jams made using fresh fruit, insisting on providing customers with the most delicious in-season flavors. At the Water Garden, you'll not only enjoy the fun of shopping, but also gain better understanding of the hardships of organic farming, and see how these organic cultivators cherish the environment, have a fervent love for this land, and work hard to produce healthy foods. Qingtian Street: From Exit 2 of MRT Guting Station, where the Orange and Green lines meet, rent a YouBike and ride toward Daan Park. Water Garden Organic Farmers' Market: From Exit 4 of MRT Gongguan Station on the Green Line, walk approximately 6 minutes in the direction of Siyuan Street (思源街). Passing the burning incense sticks and candles at Treasure Hill Temple (寶藏巖寺), you will come to an artist village. Follow the winding slope, and feel yourself caught up in the artistic atmosphere. Set your sights on the plots of land that make up the community's eco farm, adding to its flourishing landscape. According to the Treasure Hill Community Association (寶藏巖文化村協會), when the decision was made to create an edible landscape, an artist produced the first design. Residents have now adopted an eco-garden approach. Vegetables and fruit trees make up the landscape, and are integrated with the communal-eating traditions of the settlement. This has led to a community in which ecology, art, and communal living coexist. Heavy losses were sustained last year due to Typhoon Soudelor, but after a period of eight months the edible landscape was restored. 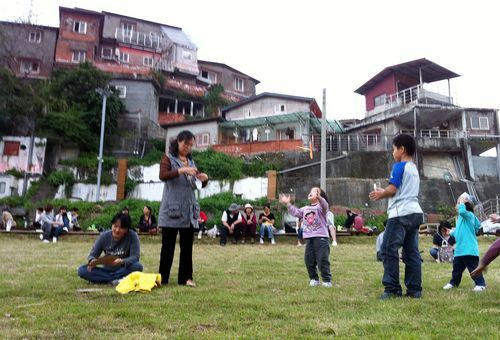 Treasure Hill Artist Village: From Exit 1 of MRT Gongguan Station on the Green Line, walk 23 minutes in the direction of, and then along, Tingzhou Road (汀州路).